Calling card of A. Lincoln Frost of Springvale, Maine, a village in the City of Sanford. He was presumably Abraham Lincoln Frost (1863-1899). Abraham Lincoln Frost was born October 14, 1863 at Springvale, Maine, son of C. Howard Frost and Lydia F. (Roles) Frost. 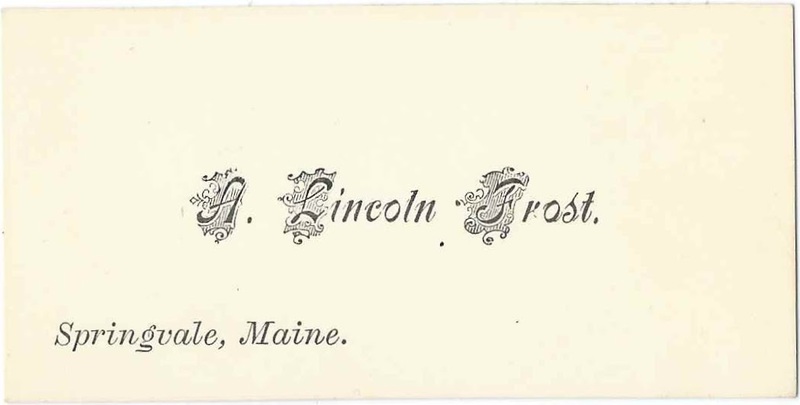 On August 19, 1894 at Lunenburg, Vermont, A. Lincoln Frost married Nellie M. Fenton, daughter of John Charles Fenton and Miama [?] Fenton. As noted in the History of Sanford, Maine, 1661-1900, by Edwin Emery and published in 1901, Abraham Lincoln Frost served during the Spanish American War and was serving on the island of Puerto Rico, when he died of cerebral congestion on February 9, 1899. I assume his body was sent back to Springvale, Maine, where his name and death dates are inscribed on the monument of his parents in the Riverside Cemetery at Springvale, Maine. Nellie, who died in 1938, is buried in the same lot.